Well I've been TAGGED - wooo I am hoping for an Oscar next (One Day) but right now I'm definitely feeling the love from fellow bloggers! Like with the awards, I'm really excited about this as it's always just such a fun way to get to know and interact with other bloggers! It's also a way for people to get their own and other's blogs' recognised and shared which is always fun! I was tagged by ZoeJohn - So thank you to her! You guys should check out her blog and give her a follow! As chances are if you check it out you'll love it because she's fab! I personally love reading peoples answers to tagging's and such - sooo I'm chuffed as now I get to answer my own - YAY! So guys I shall start with the 11 things about meee! I'm from a tiny town in Cumbria called Egremont - So, of course I'm a true northern girl with lack of elongated vowels and the lot! I ended up meeting Ben Barnes, the famous actor, after spending an hour in Disneyland Infirmary after suffering an allergic reaction - basically I was in the right place at the right time and he was premiering The Chronicles of Narnia: Prince Caspian and I was pretty much high on what they'd given me - awkward - but he was so lovely! When I was 16/17 I lived in halls for college and they were in Carlisle which is a ten minute drive from Scotland - or a fun midnight walk when drunk! I have DOZENS of pairs of shoes from flats to skyscrapers they're a MUST when I see them and then are usually a 'have' - if I can get my way! I have, literally, HUNDREDS of nail varnish's - I HATE having naked nails! I'm a Cheerleader for the Staffordshire Scarlettes! - Go Team! I own a Sleeping Beauty Aurora Doll because, I have M.E - which makes me MEGA sleepy - so my Fiance got me it and said I'm like her because I'm his Sleeping Beauty - How sweet I know!!! So that actually took me TEN times longer to think of and write than it took you guys to read - so I hope you all enjoyed some facts about meee! 1. What are your guilty pleasures? - I genuinely have 90's cheesy music on my iPod I still actually listen to... I will ALWAYS have it - I may be able to let some style go, but not the music! 2. If you had to shop in just one store for the rest of your life, what would it be? - Oh God this one is a killer hmmm Next - Because their Jeans fit me or Topshop - Because of EVERYTHING! 3. Top 3 favourite films? 4. Do you have any bad habits? 5. If you could be somebody else for one whole day, who would you be and why? - A Bloke (Probably my guy!) - I want to know what it would be like to be a guy for a day- Being a girl, I wonder these things! - Probably snakes - I don't trust them, that or mega heights! 7. 3 words that describe you? - Oh No! I literally CAN'T chose - soooo many!!! My favourite as a kid was The Animals of Farthing Wood! Just thought you all might like to know! 10. Have you been traveling? If so where and if not where would you most like to visit? 11. Whats your favorite dish to cook? - Spaghetti Bolognese - I LOVE the stuff and, if I must say so myself I make is AMAZINGLY! Well, I hope you all liked my answers and I didn't bore you all too much! I had so much fun writing this, so I hope you all have fun reading it! Plus, I hope you all understand my thought process of ramblings! Eeeek I've had sooo much fun with this! It made me excited and things like this really get me thinking about myself and I LOVE reading other's answers! Favourite piece of clothing/footwear at the minute? What was your favourite stuffed animal/toy as a kid? Maxi, Midi or Mini - you have to chose ONE?! Friday night in or out? Four words that best describe you? Oooh, do let me know if you participate guys as I would REALLY love to read your answers - it's another northern trait, I'm really nosy! I hope the questions are OK for you all - do tell me otherwise and please link back to my blog so I can see all your fascinating answers! Next time I shall pick something more about beauty or fashion, though as I think another big injection of me may be too much info haha well, I had fun so I hope you all do too! 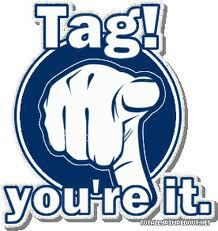 There you have it my Tag! Enjoy, participate and happy blogging! Hey thanks for the tag :) but I have already done this one here's mine if you wan't to check it out. Oh this isn't an award - it's just a fun blogger thing he thanks though! I LOOOOVE it I'm so excited for competitions in March and April! hehe Thankd for reading! If you love Tag post's - do feel free to answer my questions in a post then link back - I'd adore that! Thanks soo much! Oooh I haven't got many followers on Bloglovin so thank you again hehe I've followed your blog back and commented on your blog sweetie!